Poly Bridge is a game that I kept seeing gifs of on reddit. In it you get a set of vehicles on the left and have to construct some type of bridge with the materials available to get them to the flags on the right. It starts out easy with unlimited resources but soon starts limiting you in interesting ways. You won't have enough road sections so you'll have to build a jump instead. Or you won't have enough material to make a bridge that goes up and over an income ship so you'll have to make a draw bridge with working hydraulics. It's been a really fun game to jump into for a few minutes at a time. I think my average play session is ten to fifteen minutes, but I find myself coming back to it fairly regularly. I think most people who have fun building things would enjoy this game. I grabbed it on sale on Steam for less than $10 and you probably should too. We all know, there's always another Steam sale right around the corner. I marathoned The Flash Season 1 in three days. I haven't had a show hook me like this in... I honestly don't know how long. In the first season The Flash is easily one of the best superhero shows I've ever seen. Every single episode drives the overall season-spanning story arc forward. And the show moves along at a really good pace within each episode as well. Pacing is super important to me. When shows get too slow I get bored, tune out, and give up on them. That didn't happen at all throughout the first season of this show. It even ended on a cliffhanger that makes me really want to jump into season 2 immediately. So, I probably will. 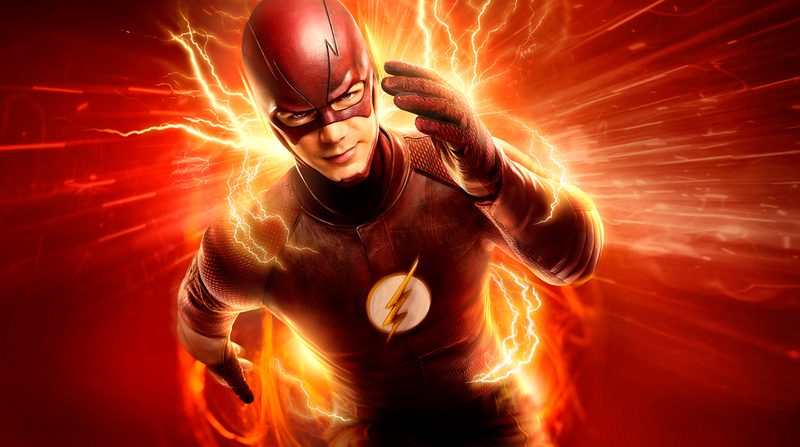 One of the coolest things about The Flash is how much fun Barry Allen has being The Flash. It's not some grimdark angsty superhero like so often happens. From the very first episode Barry thinks his powers are awesome. He has fun with them while training and while saving people. You can really tell that he loves being the Flash. It doesn't hurt that this show mixes in science, pseudo-science, time travel, and a bunch of other stuff I love. DC Comics and superheroes have never really clicked with me, so I'm as surprised as anyone that The Flash is one of the best shows I've watched in the past few years. If you haven't noticed by now I'm catching up on a lot of TV that's come out over the past 5-10 years. I finally have time to catch back up after having kids. It's just impossible when they're little. 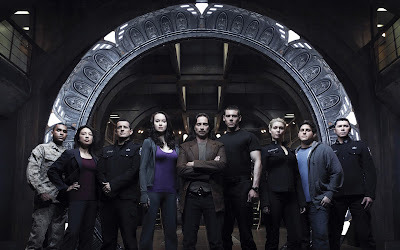 Anyway, Stargate Universe was one of the shows that I liked in my big pilot watching spree. Unfortunately, this is another show that I gave up on after a handful of episodes. I think I watched five episodes before giving up. The problem, for me, is that the show became too much of a slow paced mystery. I like Sci-Fi shows that are about exploration and discovery. In SGU there was just too much sitting around wondering about the ship that they're on to keep me interested. My brother mentioned that it also just doesn't feel like Stargate. 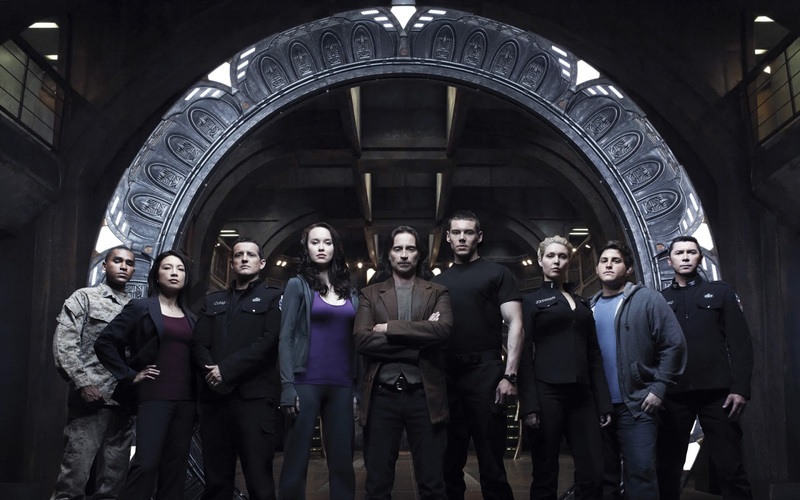 The other Stargate shows are all about exploring new places through the Stargate every week. In SGU they're just kinda on a ship. Even the episode I saw where they visited a planet through their Stargate it was just a big empty desert. Basically the most boring planet ever. I'm not giving up... I know I'll find some diamonds in the rough while I work through my big list of shows to check out. This is an iOS game that I've been playing a lot lately when I have a spare minute or two. It's actually the digital version of a board game that has been on my wishlist for awhile. 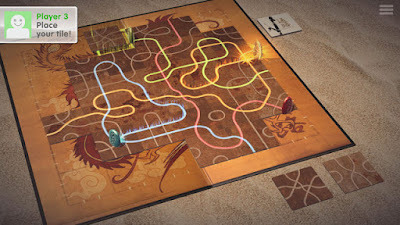 In Tsuro you start with your stone on one end of the board and choose/lay a tile in front of you. Your stone follows the path on the tile all the way to the end. Everyone takes a turn and then on your turn you choose and lay another tile. The goal of the game is to be the last stone still on the board. As the board fills up it gets harder and harder to lay a tile in front of your stone without it connecting to an already existing tile. When that happens your stone follows that path all the way to the end as well, which might send it right off the board. It's been nice to finally play it a bunch against different AI levels. It's fun and scalable. I like how it's simple enough and complex enough at the same time. Now I really want to pick up the board game version of it. After really enjoying the pilot of Star Trek: Enterprise I was quickly let down by the following episodes. Although I have to say, I really like the show's intro that walks through the history of flight and space travel. I know it gets a ton of hate too, but it's actually one of my favorite Star Trek openings. It has some character to it. After not clicking with the first few episodes after the pilot, I did what I have with a couple other series lately... I looked up a "best episodes" list. Doing so let me sample the best of what Star Trek: Enterprise has to offer. And honestly, some of these episodes are just as good as any other Star Trek show. The problem is that there aren't many of them. Most of the best episodes in the series tend to break the normal formula of a Star Trek episode. That's when you can tell both the actors and writers are truly at their best. It's kind of funny, I find myself once again drawn to some of the time travel episodes just like when I watched Voyager. Maybe I'm just a big fan of time travel in general... I'm starting to think that's the case. 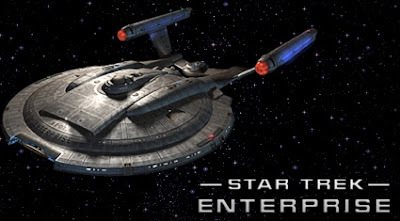 The finale of Star Trek: Enterprise is interesting in that it takes place in the middle of a Star Trek TNG episode and stars Riker and Troi but deals with the Star Trek: Enterprise crew as a holodeck program. It's an odd framing device but definitely interesting and it manages to tie this first crew into the other crews of the Star Trek universe. Overall, I'm glad that I've watched a handful of these episodes and gotten context for the early part of the Star Trek universe. That being said, I can't recommend this one. Not even for huge Star Trek fans. There's not enough good content here to balance out the bad. I'm ok with the time I spent with it, but you probably won't be. 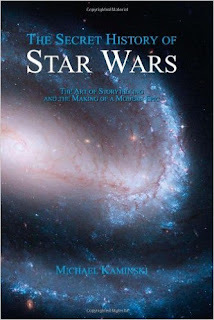 The Secret History of Star Wars is a book I really wanted to like. The author approaches the behind the scenes history of George Lucas and the creation of the original trilogy with an in depth look at the process. He uses historical documents and drafts of the screenplays along with a ton of interviews and testimony from Lucas and those who know him well. I made it about 40% into the book before getting frustrated and putting it down forever. The problem I had is that the author often retreads the same ground from multiple different sources. He'll walk through an interesting historical note, back it up with quotes from relevant people, and then seem to start moving onto the next thing... but then go back to the beginning of the subject instead and use different quotes to say the exact same thing. And then go back and do it a third or fourth time. I wonder if he had a word count that he promised his publisher because it truly feels like he's just adding fluff to make it longer. I've written enough school papers to know when I see it. Anyway, this could have been a great book if it had an editor go through and cut the length in half. As it stands I can't recommend it, even for you fellow Star Wars die hard fans out there. In this final season of Voyager it seems like the writers are finally having fun with the existing crew again. I bet they feel confident that they can start wrapping up character arcs since it's the last season and it really shows. The characters all have moments that develop them further and it's great to see. I love that two of the main characters, Tom and Be'lanna, finally get married. It took basically the whole series, but that's ok. They also get pregnant! It's really good to see characters reach the completion of their arcs. It's great to slowly see the crew get more and more contact with Star Fleet as they get closer to home. 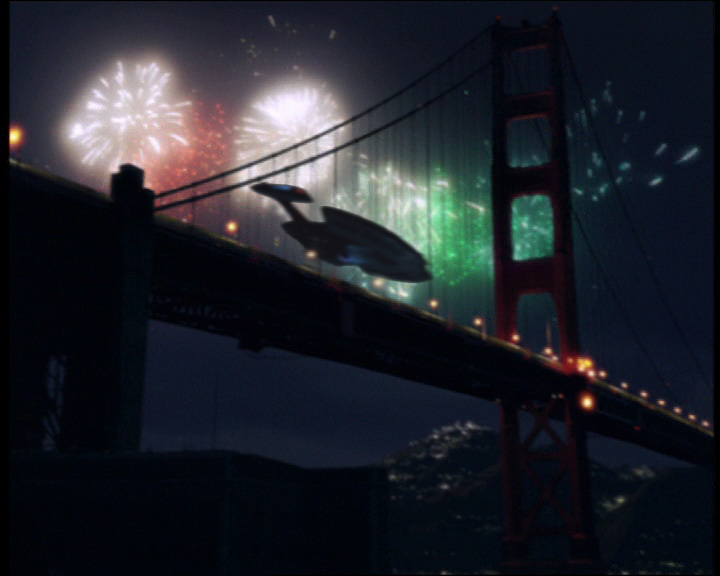 Some of my favorite episodes of the season were ones involving contact with Star Fleet after so much time apart. There's an episode where the Doctor gets to fight for his legal right to be acknowledged as a person and not an object. While he doesn't get full legal acknowledgment as a person he does get legally recognized as an artist, which seems like the first legal step in the right direction. It's a really nice way to wrap up his story and show what he's become. Toward the end of the season Neelix finds a permanent home in the Delta Quadrant and the crew gives him an official Star Fleet Ambassador title. The whole crew gives him a big sendoff and says goodbye. Again I find myself drawn to episodes with time travel too. There's a really cool episode where the ship gets divided into a bunch of different timeframes and only one crew member has the ability to move between them. It's a super interesting way to do a retrospective episode of past events (and possible futures) without it feeling shoehorned in. The series finale finds the crew finally returning to earth, along with one last bit of time travel from a future Janeway. I'm really glad they made it back but I would have loved to see one more episode about what happens now that they're back home. Besides that, it was a good way to end the series. 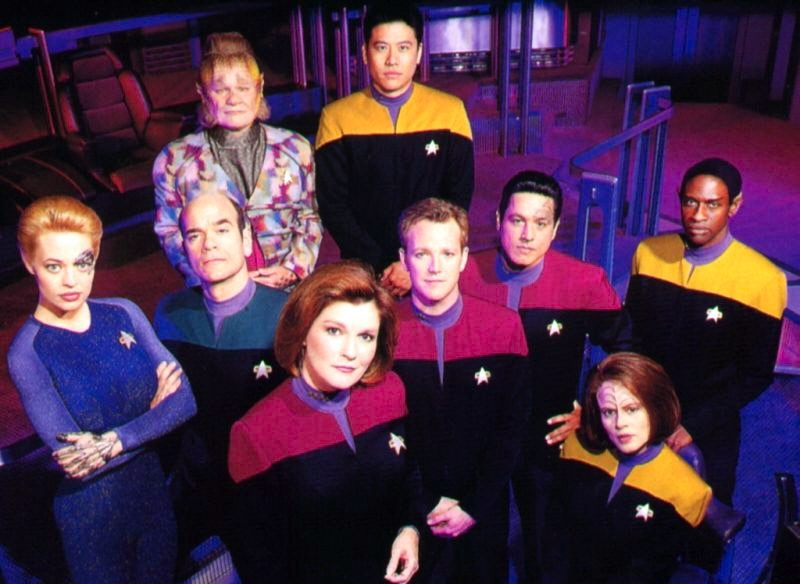 Overall, Voyager is still my favorite Star Trek TV show. Although it shows some of it's age in the production values it tells a unique story that is different enough from the other Star Treks to be extremely interesting. It sags under it's own weight a bit in seasons 5 and 6 but ends strong with season 7. Mainly this just has me excited to see what a modern Star Trek show looks like when the new one airs in 2017! I downloaded the brand new Fire Emblem Fates earlier today when it released and after picking up the Birthright version I had enough time to sit down and play it for one full charge of my 3DS battery. My initial impressions are really good. It has everything I loved about the first 3DS entry in the series, Fire Emblem Awakening, but it's been refined and added to. The core of the combat system is still the same as is the relationship system and I'm really happy with that. It didn't need big changes. The minor tweaks they've done are for convenience. The biggest difference I've noticed right from the start is the attention paid to the story. In Fire Emblem Awakening it had a very typical (and stereotypical) story that was easy to predict even though it was well executed. In Fire Emblem Fates they've created three unique storylines depending on a key choice you make near the beginning of the game. I'm already seeing huge ramifications and I can see that these storylines are all going to tie into one another in interesting ways. It honestly has me excited to play through all three versions of the game. For now, I'm happily playing Fire Emblem Fates: Birthright. I'll follow up with more in depth impressions or a full review later. If you've been on the fence about this game just know that it gets a rousing endorsement from me. I think that after writing this story for six seasons the writers are mostly out of new ideas. There's a ton of reset TV this season. I was able to fly through this season because so many of the episodes were fast-forwardable or skippable. Again, new characters are shoehorned in where they aren't needed, like the Borg children. It feels like they ran out of new ideas for the existing crew so the need to tack on extra characters to have it feel fresh. Instead, I just don't care about the new characters. That being said, there are now some episodes that feel like they will lead to the conclusion of the series. There's an especially cool one that mostly takes place in San Fransico. 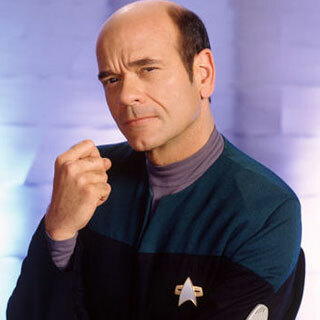 There's a Star Fleet officer obsessed with re-establishing contact with Voyager now that they know the crew is alive. In the end he's able to make contact for a minute or two and Voyager gets to trade ship logs and information with Star Fleet. By the end of the season Voyager has just established a temporary data link with Star Fleet that they will be able to reproduce every 32 days. Finally some consistent contact with home! Watching them get tied back into Star Fleet should be interesting. At this point I'm kind of sick of the week to week journey throughout the Delta Quadrant because it feels like the writers are sick of it too. But, I'm still super excited to see how the series concludes. And the episodes that push the story of traveling home further along are still really good. If I remember right the crew eventually makes it back to earth but it's been so long since I watched the show that I don't remember how it happens. This is the first season of Voyager that seems full of pointless episodes. This is where "reset TV" rears it's ugly head. A lot of TV shows in the 80s and 90s were set up so that they basically wrapped up every episode so neatly that you could watch it the next week without having missed anything. Up through season 4 I felt like most of the Voyager episodes at least had some character development that pushed things forward each episode. For season 5 this isn't true at all. There are so many episodes in this season that don't move the story or characters forward at all. You can easily watch the cold open and then the last 2 minutes and still understand everything you needed to get out of the episode. In a lot of cases you could safely skip the episodes entirely. At this point I'm committed to finishing the series but season 5 put a damper on my enthusiasm. At least I know that there are only 7 seasons and then the show wraps up. It's not like nothing happens at all. The crew has a few incidents that push them ten or twenty years closer to home with new technology (which conveniently only works for a limited amount of time). But some character growth happens too. The only kid on the ship becomes old enough to become her own character. Seven continues to develop into more of a human and less of a Borg. Harry Kim feels like he's finally growing up. The crew has had enough incidents to bring them closer to home so that they finally feel like getting back to the alpha quadrant is a when not an if. 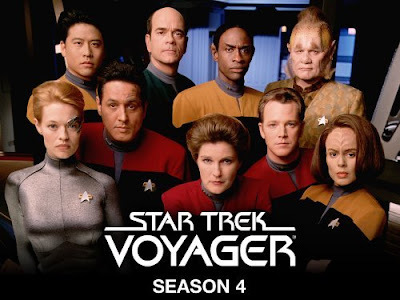 The season ends with the first of a two part story where Voyager makes contact with another Star Fleet ship which has been pulled into the Delta Quadrant. I'm sure it won't last, but it's really cool when the crew of the Voyager gets some interaction with Star Fleet. There have been a couple of these that I haven't mentioned but I honestly really like the episodes where the Starfleet crews from the 29th century show up and have to clean up issues with the timeline. They're basically time travel police and they end up drafting members of the Voyager crew because Voyager keeps messing up the timeline. I love these episodes. I would probably enjoy an entire Star Trek show in this setting. A crew from the 29th century jumping to important places in the Star Trek timeline fixing problems. I'm starting to get really excited for the new Star Trek series coming out on CBS next year. I don't usually do breaking news, but Nintendo Accounts are live now in the US (and maybe worldwide). They've been launched in Japan for awhile now but we're just getting them in the West. The Nintendo Account is what the company is using going forward instead of the old Nintendo Network ID (NNID) system. It's what all their new consoles and mobile efforts will connect to. As a PSA go grab your preferred username before someone else does! And then go "pre-register" for the new Miitomo app to earn some of the new Nintendo reward currency on your account. The new Nintendo Platinum is taking the place of the old Club Nintendo system. I'm really excited to have rewards back from Nintendo. They've hinted all the rewards will be digital, but that's fine with me. Discounts and money back for digital purchases would be great. 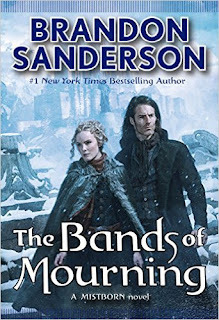 Bands of Mourning is the third book in the second set of the Mistborn series. It follows Waxilliam six months after the events of Shadows of Self. It directly deals with the fallout from that book and it picks up really quickly. I think Bands of Mourning was the best paced and most consistently interesting in this set of Mistborn books. I'm sure that part of that is because it ties into the previous book so well and builds on it. I didn't feel that way nearly as much between the first and second book. Bands of Mourning finds the main characters needing to leave the central city where they've spent the last book and go investigate what's happening in the wider world. They're looking for a legendary item, the Bands of Mourning, because it could have a power that would change the world. While I still don't love this alternate history early 1900s type of setting at this point I really like the main characters and I want to know what happens to them. If you've read Alloy of Law and Shadows of Self you are probably equally invested in these characters and you'll get a lot out of Bands of Mourning. I thought this might be the last book of the second Mistborn set. This book leaves off after telling a complete story but leaves just enough information dangling to the point where I really want the next book now. There's an author's note at the end that says book four will be the final novel in this second Mistborn era. I really recommend the Mistborn series as a whole, although Bands of Mourning isn't the place to start. 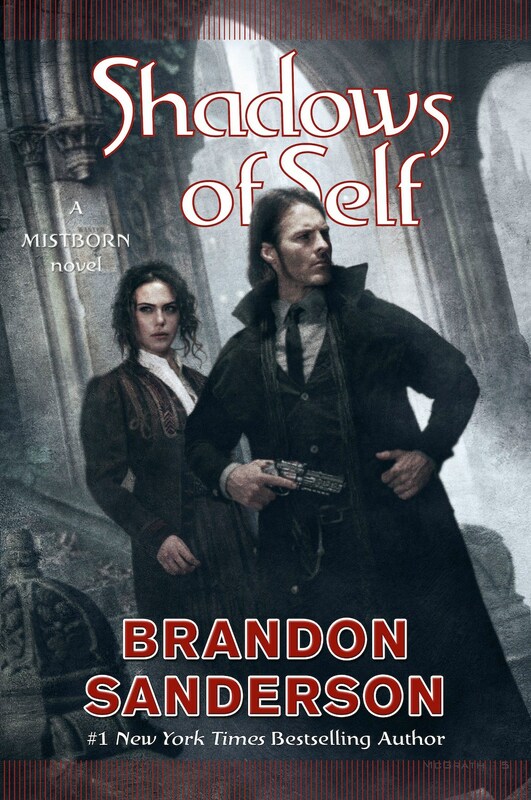 The best jumping on point is either the very first book of the first era titled Mistborn or the first book of the second era titled Alloy of Law. 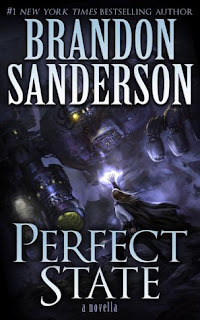 I continue to really enjoy Sanderson's writing. I'm always excited to read what he writes next! 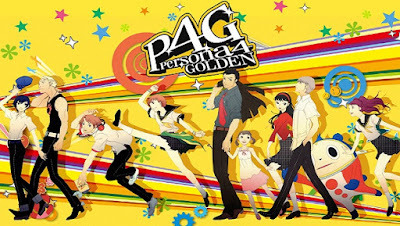 Persona 4 Golden is one of the greatest JRPGs that I've ever played. It's amazing. I was blown away. I haven't had a game hook me like Persona 4 did in such a long time, it was absolutely a treat. The game is extremely story driven. If you don't like story in your RPGs then this one isn't for you. The whole game encompasses a year in the life of the unnamed protagonist (you) as you spend a year in a new town as a transfer student. You move in with your uncle and cousin in the small town of Inaba and start the school year. You begin to make friends with other students when a series of murders happens in the local community and things take off from there. It turns out there's a whole other world that this one is connected to and inside of it are shadows (enemies) and Personas (positive super-powered versions of people). A lot of the fun is the mystery of finding out what is going on with the connection between worlds as you and your widening group of friends keep finding out more. 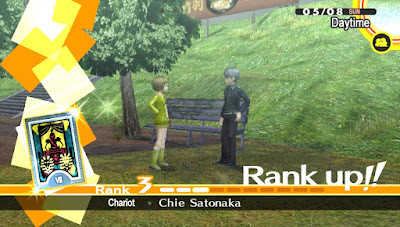 There's so much story in this game that I can't even do it justice in a summary, so instead let's talk about Social Links. 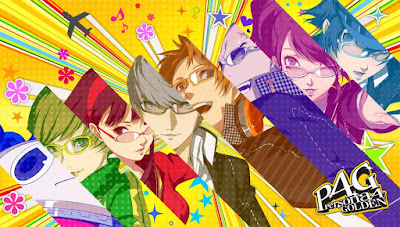 Social Links are my favorite part of Persona 4 Golden and from what I've heard they are a staple of the franchise. Every character you form a meaningful relationship with is represented by a Social Link. Every time you spend time with that character you have the chance to advance the Social Link. Sometimes you will and sometimes you won't, but every time your relationship will evolve. A huge part of this game is about how you spend your time and who you spend it with. Will you spend time trying to improve you social stats like Courage, Understanding, Knowledge, Diligence, and Expression? These will open up more options and more Social Link possibilities in the future. Or you could spend your time at jobs making money. Or you can focus on spending time with people and increasing those Social Links. You'll end up doing all of the above and trying to find the best thing to do with your time. For me, this is the best part of the game. 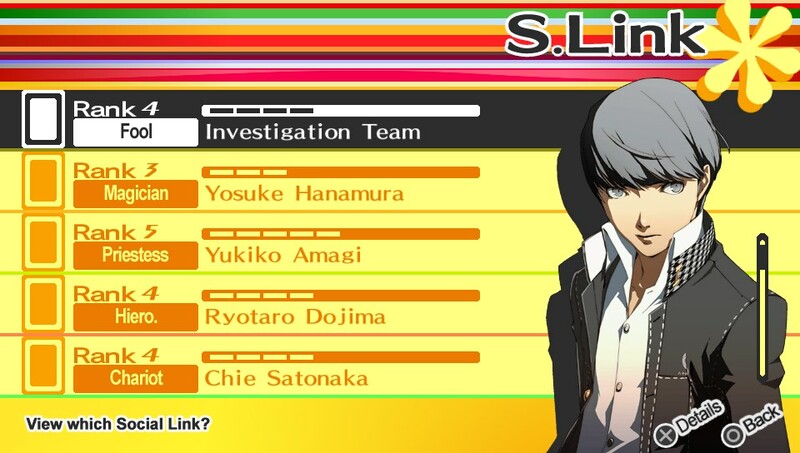 I love the Social Links system so much. In a way it reminds me of the character relationship system in Fire Emblem Awakening, which I also loved. The relationships and story are what drive Persona 4 to be what it is. The combat is fine, but nothing too extraordinary for a JRPG. It's serviceable but also kinda whatever. That's not what the game is about. Although I do appreciate the no random battles. The thing is, you'll only encounter battles when you're in the other world. And you'll spend months of time in the real world without ever visiting the other world. These were my favorite parts of the game. Just exploring this small town and growing my relationships with people in it. I'm still processing all my feelings about the game but it easily enters my top 3 JRPGs of all time. Right under Final Fantasy IX and Chrono Trigger. It's that good. Now I know why this game has a cult following and why people are so excited for Persona 5. 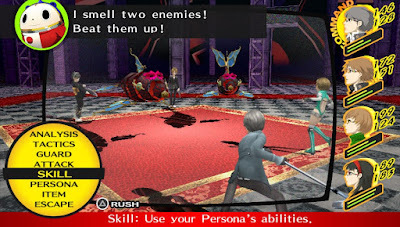 It turns out I picked a great time to dig into Persona 4 since Persona 5 is coming out later this year! I'm super excited to find out more about this next entry in the Persona series! 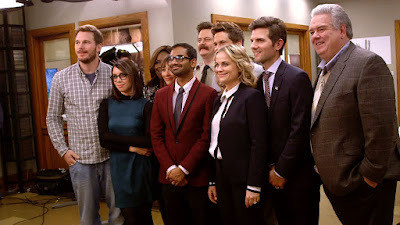 I marathoned Parks and Recreation with my wife over the course of about a week and a half. We had never tried the show but after watching the first few episodes we were hooked and flew through all seven seasons really fast. It's a really funny modern sitcom. It's in the style of a lot of modern sitcoms where the people know they're being recorded for whatever reason and often look at or play to the camera. The style is a bit of an acquired taste, but if you've seen it before you probably know if you like it or not. It's an ensemble cast of government employees, mostly in the Parks and Recreation department. It sounds super boring which is probably why I never checked it out before, but the characters make it hilarious. 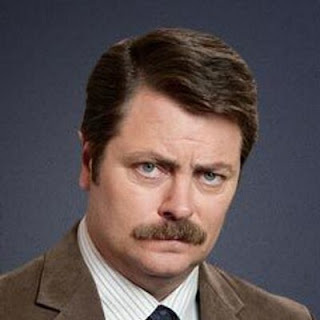 I finally see why everyone loves Ron Swanson. The seasons are also really consistently good. It falters a bit in season 5 but manages to find it's legs again by the end of the season. Even then it's not bad, it's just not as good as the other seasons are. I highly recommend you give this one a try if you, like me, missed it while it was airing. You'll know within two or three episodes whether it's for you or not. I was super happy to find a new show to dig into. And I'm so in love with the streaming model of TV. Watching that many seasons that fast is actually the way I prefer to watch a show now. I have an un-popular opinion on The Witness. I really didn't like it that much. I keep seeing it be lauded with praise but I found the core of the game frustrating and boring at the same time. 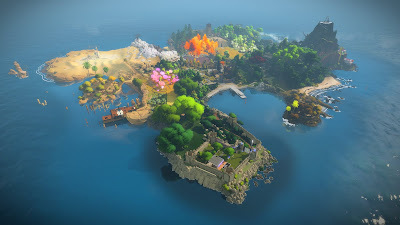 You see, The Witness looks like it's going to be a gorgeous game of exploring a beautiful island. And in a way it is. And I love that part of the game... I wanted that to be the game. Exploration is a huge motivator for me in the games I play. But The Witness, at it's core, is a series of line puzzles. They come in different shapes and varieties but the whole game is line puzzle after line puzzle after line puzzle. I was bored of it so fast. I honestly would have had more fun with the game if every puzzle were able to be solved by a simple left click. That way I could have wandered the island to my heart's content. I even held out hope to the very end that maybe the ending of the game would tie the story of the island together and give me some narrative payoff. If it had I wouldn't be writing this review the way I am. Instead, it was a letdown. Even after getting both the normal ending and the secret ending. In the end The Witness was just line puzzles for the sake of line puzzles and that's really sad for a player like me. I feel like the 3D exploration could have been it's own game. The line puzzles could have just been a mobile app or something instead. I know people out there really love this one, but I don't. One of my biggest goals for last year with media was to stop always being completionist. I have the habit of feeling like I started something so I should finish it. I did pretty good last year. From sampling all my Steam games in my library to finally being able to walk away from a book partway through. I'm trying to continue the trend this year too. It's allowed me to sort through so many games, books, movies, and TV shows while actually spending time on the good stuff once I find it. Recently, I tried reading a different series by an author that I like and got about a quarter of the way into the first book when I realized I wasn't enjoying it at all. It wasn't for me. And that's ok. Being ok with it is the biggest accomplishment of this for me. It used to be that if I was a quarter of the way into a book I was already committed and would finish it even if I didn't like it. You can probably tell how fast I've flying through different kinds of media now based on how many "impressions" posts I do vs how many "review" posts go up. If I bounce off something super fast I won't even write about it, but when I've played/read/watched enough to get a feel for what it's offering I always try to do an impressions post before moving on to the next thing. Media consumption feels so much different now and I can tell it's for the better. I'm spending my time more wisely and enjoying my leisure time more. 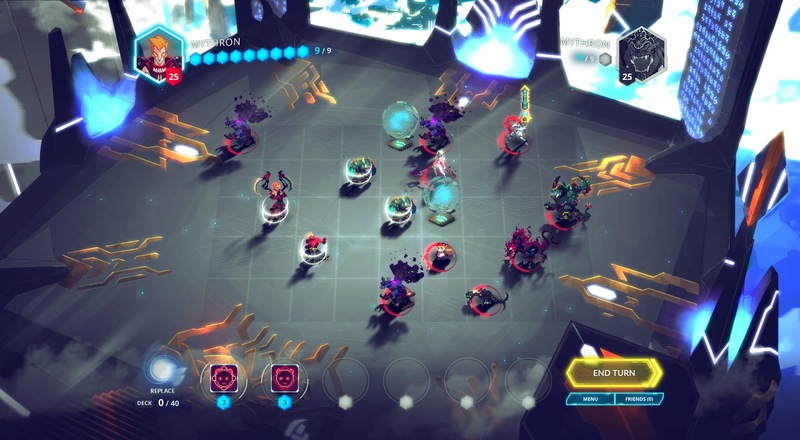 I played a bunch of Duelyst and it's a fun mix of strategy, turn based games, and deck building. I really like the potential here. The battle system has a general who can use abilities and summon monsters from your deck. You draw new abilities and monsters every turn so your options are constantly changing and evolving. Instead of these being cards they turn into actual characters that go on a board. 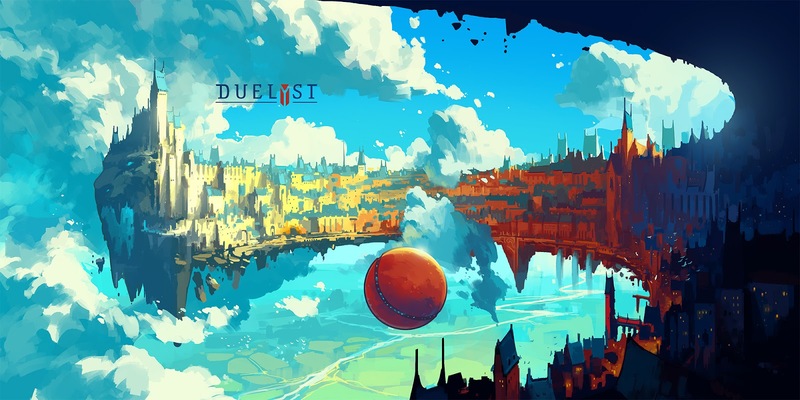 The game mixes current digital card games with turn based strategy games on a grid based field. It's a really fun combination. It honestly reminds me of a fresh modern version of Hero Academy which I loved when it came out. 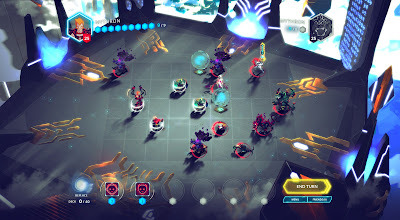 Except with Duelyst the battles happen much faster because it's not asynchronous. Duelyst is still early access but it's obvious that this game has lots of potential. I played enough to know that I like it and that I'll want to play it when it actually releases. But, I don't like pouring a lot of time into early access games so this one will go to the side until it's officially released. When it does, you should seriously think about trying it. Right near the beginning of the season some big changes happen on Voyager. Kes leaves the ship in a blaze of telepathic glory that superspeeds the ship another 10 years closer to the Alpha Quadrant. Right around the same time Seven of Nine comes aboard. Seven of Nine is a Borg who is freed from the collective and quickly becomes one of the most interesting characters on the ship. She brings into question what it means to be human and how to discover your humanity after being raised without it. The episodes that focus on her are some of the best of the season. There's also a lot of development between Tom and B'elanna. It's the first real romantic relationship on the ship that we see consistently being developed. This is the season where they finally come together and have an official relationship. It's a nice common thread that keeps moving forward throughout most of the episodes in Season 4. Not to mention that the Doctor once again gets a couple cool episodes with things that only his holographic self can do. He's still my favorite character. One of the most exciting developments of the season is that Voyager finally communicates with the Alpha Quadrant through an alien communications relay before once again getting cut off. But they got updates from home, and now Star Fleet knows they're alive and on their way back. It's nice to see big progress on the trip back to the Alpha Quadrant. I'm still having a good time watching the show and I'm excited to start season 5! I'm glad this Star Trek clicked with me. It's making me really excited for the new Star Trek that CBS is launching later this year. 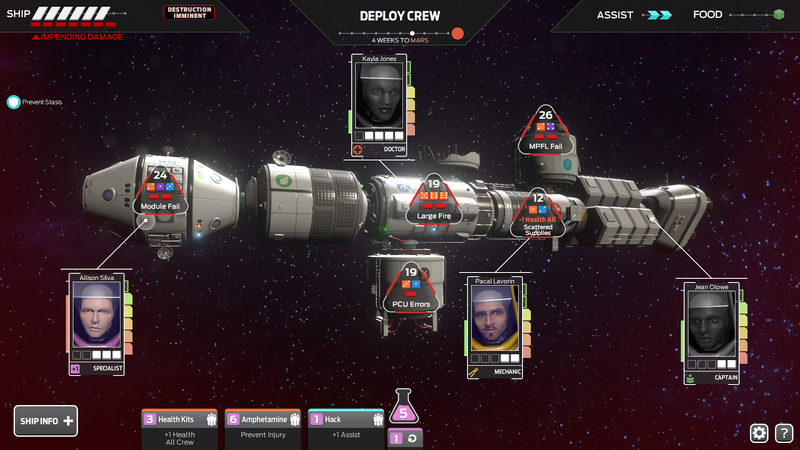 I played a bunch of Tharsis after hearing about it a few weeks ago. I thought it was still early access, but it turns out it's a "full game". It sure doesn't feel like it though. The core of the gameplay system is there but it feels like it needs options, missions, difficulty settings, and more fleshed out gameplay. But, I really like what's there. 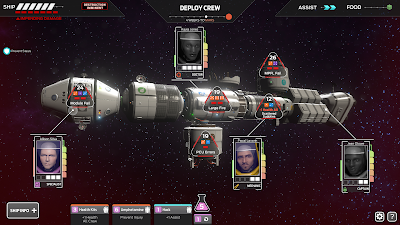 Tharsis is a game about traveling to Mars and everything goes wrong. It's a crisis management game. Every turn you decide where your crew goes in the space traveling vessel and you roll dice for the crew to try to complete objectives. It's honestly like a board game made to be a video game. I love board games and video games these days, which is what attracted me to Tharsis in the first place. Honestly, I really like it, but it feels incomplete. This one is going to go on the backburner for awhile until they add more to the game. It's obvious that they intend to add more to the game and tweak it over time. I bet it's going to be really fun in about six months. 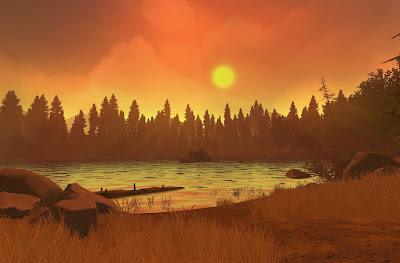 I just played through Firewatch and loved it. The game only clocked it around the 4 hour mark for me, but it was wonderful. I'm so happy when a dev tells their story and then wraps up the game. This is the perfect example of a game that doesn't need to be 8+ hours to be worth the money. In Firewatch you get a little bit of backstory about your character and then start your first day on the job of watching for forest fires from your tower. Your only line of communication is through a walkie-talkie to your direct supervisor and that's where the majority of the narrative takes place. But things quickly start to happen that you need to go investigate. Most of the game finds you wandering the wilderness around your tower digging into things that are going on. You use an actual compass and map along with a limited gear set to traverse the terrain. Not to mention the in-game disposable camera! It only has around 20 shots, so make them count. At the end of your game you get to see all the pictures you took and it even generates a webpage where you can go download them. That screenshot above is a picture I took in-game with the camera during my playthrough. It's an amazing game for explorers and for narrative driven gamers. I haven't had a game grab me and amaze me like this in such a long time. I'm so happy to have found a game that clicked with me so easily. I know that the price point of ~$20 matched with the playtime of 4-6 hours will drive some people away, but I felt like it was worth every penny. I already know that I'm going to end up replaying it very soon. I highly recommend this one. Check out Firewatch. It's out on basically every major system today. 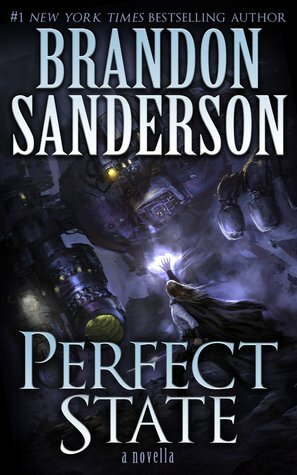 Perfect State is a Brandon Sanderson novella. As such it has a unique world and fantastic worldbuilding, just like all of his writing. I really liked it. In Perfect State each person is in their own version of the matrix but they know about it. The computer generated world adapts to them as they live their lives. The worlds can be anything from a modern setting, to a fantasy realm with magic, or super futuristic high tech. In the end the human race is basically brains in jars. They've generally come to terms with it. The really interesting parts occur when these humans interact with people from other "states". Essentially people from other matrixes. Someone who has lived their entire life in a realm of magic can suddenly find themselves dealing with future tech and robots. It's a very interesting culture clash. Since it's a novella it's a quick read. I listened to it on Audible and it was about a 3 hour listen. Perfect State is the best novella I've read in the past year. I highly recommend it. Over the past couple days I've gotten to start digging into Final Fantasy Explorers. It's a Final Fantasy spin-off game for the 3DS. It's basically Monster Hunter by way of Final Fantasy. After somewhere in the 6 to 8 hour range with the game I'm feeling very "meh" towards it. I love the premise, getting to use Final Fantasy classes against monsters in the world. But the game itself feels slow and directionless. It has really bad messaging to player. It's hard to know what to focus on or what to do to improve your character. There's also almost no story, which is typically something that keeps me invested in Final Fantasy games. I've finding Explorers less fun than I hoped it would be. But it's not a straight up bad game. There can be moments of fun against enemies or fighting giant eidolons out of the Final Fantasy lexicon like Ifrit and Shiva. I think I'm going to put this one on the backburner. It might be better suited as a game to play while doing something else, like watching TV or listening to podcasts. Honestly, I'll probably pick it up next time I have to do air travel. That always seems like a good time to dig back into 3DS games that I've moved on from. I'm also going to wait and see if the community puts together good resources for this game. I feel like if I understood how to progress my character better and had a clear goal to work for I would be having so much more fun with this game. I heard some good things about Punch Club so without really knowing what it was I picked it up on iOS since it was only a couple bucks. Punch Club is about training, improving stats, getting new abilities, and then using all that against other opponents in a fighting league. It kinda has a Rocky vibe to it. That underground old school boxing training. Kinda. But really, at it's heart, Punch Club is an optimization engine. It's for people who love to optimize everything. If you're a theorycrafter or optimizer I can't think of a better game for you. While I like RPGs that allow me to find efficient ways to do things... there really isn't much more here. It's just an optimization engine. That's not enough to hook me. It doesn't help that the setting and themes are ones that particularly appeal to me. But if you're someone who loves to optimize the hell out of your RPGs, you really should take a look at Punch Club. 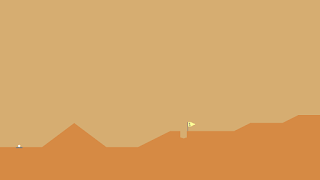 Desert Golfing is a mobile game I've heard about off and on for awhile. It's a deceptively simple concept. 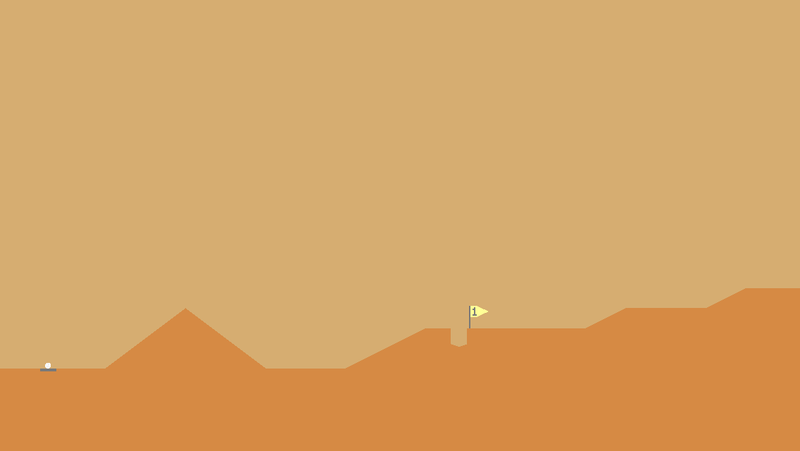 You use trajectory aiming on a 2D plane to hit a golf ball into a hole... in the desert. Hence the name. The complexity comes in because some of the holes get extremely tricky. And holes never repeat. I was really confused after hole 18... there was no menu, no stats screen, no selection options... it just went to hole 19. Then 20. Now I'm on hole 503 and I thought it was time to write some thoughts on the game. Honestly, this isn't ever going to be a game that you monotask. That is to say, this is a perfect game to play while doing something else like listening to a podcast or watching TV. It's great as a second activity when you're doing something that doesn't take up all your mental RAM. It seems like this desert goes on forever. So, it's a game I'll keep picking away at over time. It's pleasantly simple. Oh! And one time I saw a CACTUS! EXCITING! Yeah, ok, I'm late to the party. I went back and forth about picking up this game ever since it released. 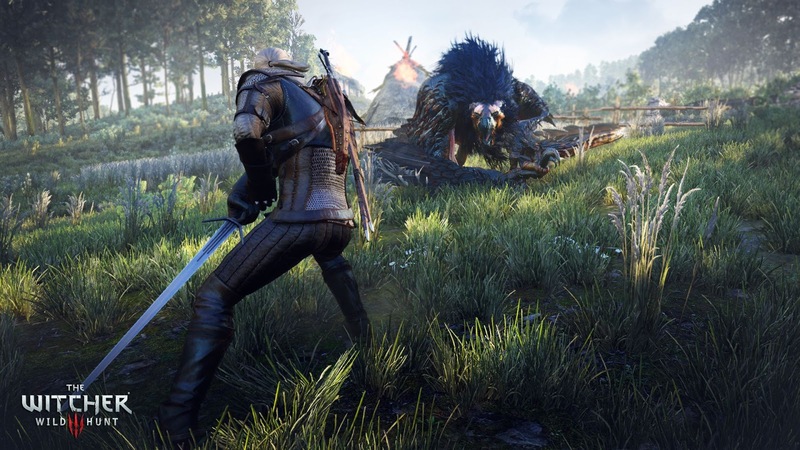 I had tried the first two Witcher games and they didn't click with me, but I kept hearing rave reviews about the series. Then this third game launched and it's ended up on so many game of the year lists that it's crazy. One of the biggest Witcher advocates I've seen is Syl. She's a long time blogging and twitter friend of mine (she's awesome, you should follow her on twitter) and I think she finally got sick enough of my indecision that she grabbed the game for me when it was on Steam sale. I have to say, thank you so much Syl! This game is great! I didn't think I was in a mood for another open world game, but this game has been fantastic. The story hooked me within the first hour and I went almost entirely critical path ever since then. Even going critical path through this game I could see the detail to worldbuilding and dedication to realistic side quest encounters. I chose to stay on the main quest because it feels like it's time sensitive and I just constantly wanted to see what was next, but the few times I let sidequests pull me away I was floored by how much detail was put into them. I can see why so many people put so many hours into this game. 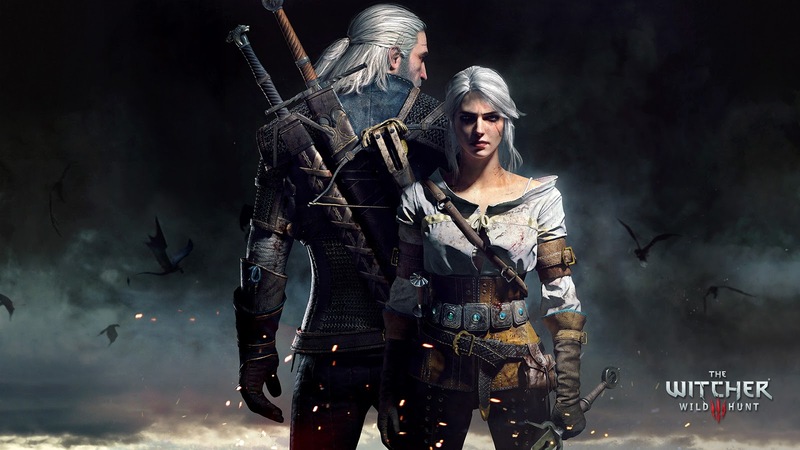 The main story finds Geralt (The Witcher) trying to track down his adopted daughter Ciri who is on the run from The Wild Hunt. She's an adult and very capable of taking care of herself but she's definitely in over her head. The whole chase to find her I constantly felt like I was about to catch up to her. That's the main drive that kept me on the main quest. No random stranger I don't have time to kill a monster for you, I have to find my daughter. As a parent it's a strong motivation. While the story and worldbuilding excelled, the gameplay itself was... fine. It wasn't anything groundbreaking. Almost every gameplay system I touched felt like games that I've played before. They all worked fine but they weren't the main draw of the game for me. With the storytelling, characters, and worldbuilding I can definitely recommend The Witcher 3: The Wild Hunt. If you've been on the fence about it maybe it's time to jump in. The developer, CD Projekt RED, truly impressed me. While I loved the main story and felt driven throughout the entire game, this old medieval style isn't really my favorite setting. But wow did they commit to it and flesh it out into a full world. Imagine my joy to learn that their next game is a Cyberpunk futuristic sci-fi romp. Cyberpunk 2077 was barely on my radar before but now it's staying on my most anticipated games list. This is another in the long line of Brandon Sanderson novels I've read. Wow, he's good at staying productive and getting his books completed. This is the latest in his Mistborn series. The Mistborn world has great worldbuilding (as does all Sanderson writing) and a really cool magic system. Magic users are able to burn specific metals inside their body to produce very specific effects. It ends up being weirdly precise and scientific while being awesome at the same time. The last book in this series, Alloy of Law, was a jump forward from the original trilogy. The events of the first trilogy are mostly myths and legends now. The world has advanced past the medieval setting and is made up of mostly western and early 1900s type settings. Basically an entire set of new characters were introduced. This book, Shadows of Self, starts to bring the old and new series together. Characters and events from the first trilogy begin interacting with the new cast. I didn't really like the western setting of the previous book, but this one takes place in a major city and feels more like an alternate early 1900s. It's a setting that I still don't love, but it's much more appealing than western. The characters, locations, and situations from the original trilogy start to line up and interact with the new ones. It started off a little slow but by the end I was completely hooked and torn through the last third of the book in one night. I love the magic system and underlying story ideas in the Mistborn series. I'm really tempted to go back and re-read the original trilogy after finishing this one. But, I think a new one in this series is due out soon so I'll probably wait for that instead. I would still recommend this series for sure, but this isn't the place to jump on board. If you're more interested in a fantasy setting go back and check out Mistborn which kicks off the original trilogy. If the fusion western/industrial revolution setting sounds more like your style then start with the book right before this one, Alloy of Law. Either of those are great places to get started with the Mistborn series. This book hooked me. I started it not really expecting much and ended up finishing it over the course of one weekend. It's a biography but it's mostly about his history of creation in media. It doesn't focus much on his childhood, and it's all the better for it. Instead, it's broken down by what he was working on and when that happened. 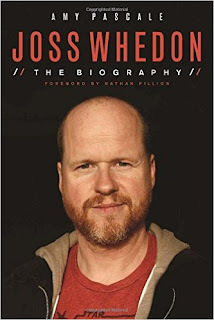 There are multiple chapters devoted to some of the longer works, like Buffy, but it covers all of his film, video, TV, and comics up through The Avengers and prepping for Age of Ultron. The book gives lots more context for his work and it's made me appreciate things I already liked, but in a new light. I have to admit, as soon as I finished it I re-watched Dr. Horrible. It's probably my favorite made for the internet thing ever. Mostly, it just makes me excited to see what his next project will be. I understand Joss Whedon as a creator so much more now and I'm definitely already interested in all of his future projects. For me, he's now one of those creators that I'll always keep an eye on.